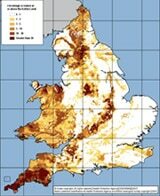 Home » Latest News » Basement Waterproofing » Think radon only affects the South West? Think Again! There is a common misconception that radon only affects the South West of England, predominantly Devon & Cornwall. Whilst high levels of radon are found across these regions, there are many other parts of the UK also affected by radon. As radon mitigation specialists, we are called in to help clients reduce radon concentrations in their homes across the country. In a single day, we recently designed mitigation systems for three residential properties in the South East. Each had been tested and found to contain radon levels in excess of the recommended concentrations, leading the owners to call upon our expertise to specify a system to reduce the radon levels. Firstly, we visited a property in London’s SW19 district where a new basement had been created beneath the property. Basement digouts are prevalent in London and whilst most developers now take special care in providing a waterproofing solution to ensure the basement doesn’t suffer from water leaks or dampness, protection from radon gas is often overlooked. The Code of Practice for below ground waterproofing (BS 8102:2009) requires designers and contractors to take account of radon in all basements, so an element of gas protection should be incorporated in all new basement creations. There was no such protection in this property’s new basement, and testing upon completion revealed elevated radon levels were present. propertECO specified the Radvantage System to address the radon levels without compromising the basement waterproofing. Another case of a property with a basement and high radon levels was seen at our second visit, a house in London’s Notting Hill. In this property an existing cellar had been converted into habitable accommodation but again, no radon protection was installed and testing after compl etion revealed elevated concentrations. Finally, we designed a mitigation system for a home in Surrey where the owners wished to reduce the high radon levels that they had discovered. Apart from having elevated radon levels, these properties all had something else in common; none of them lie in designated radon ‘affected areas’. When consulting the indicative radon maps, all three properties are in ‘lower risk’ areas (those parts shown in white), yet upon testing all three were found to contain high radon levels. This highlights the importance of carrying out a radon test in your home wherever it is located.